Always a good contender for using up leftover mash or roast veggies from a Sunday roast, bubble and squeak is equally easy to make from scratch. Serve on its own as nutritious bowl food or with a little shredded chicken or our easy lamb stew. Kids like bashing this up with a pestle or masher. Feel free to add cauliflower, peas or a bit of whatever you fancy. 1. Preheat the oven to 220°C/425°F/Gas mark 7 and boil your kettle. Drizzle a little olive oil in a roasting tin. 2. 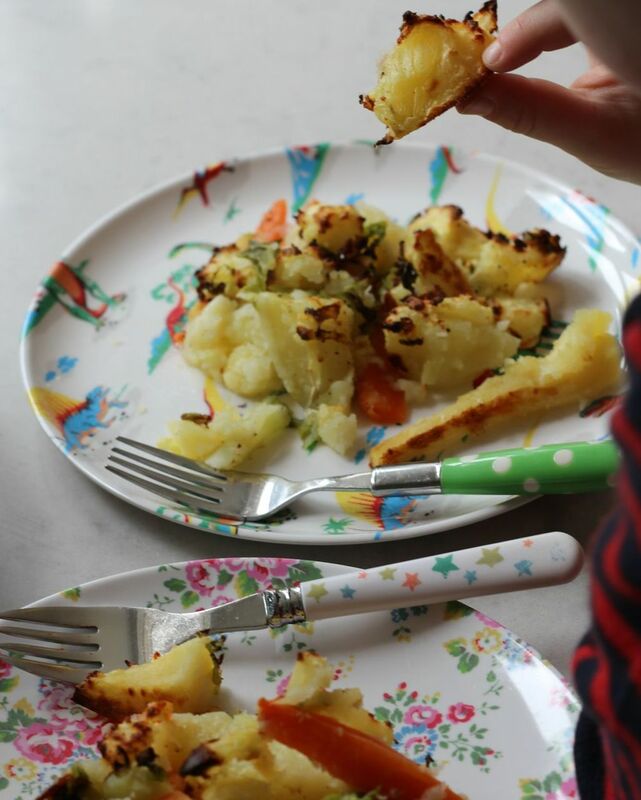 Help your kids to peel and chop up the potatoes, carrots and parsnips. You want the pieces of each vegetable to be roughly the same size so that they cook at the same speed. Put the root vegetables in a pan with the boiling water and simmer for about 10 minutes. 3. Once they're on, shred the spring greens or savoy cabbage and put in a colander that fits on top of the pan, then cover with a lid and steam as the root vegetables finish cooking. Drain everything well and return the lot to the pan. 4. Get your kids to pound it all up a bit with a pestle from a pestle and mortar or a masher (it only needs a rough bash as it's nice if all the veg retain their separate identities a bit). Spread the mix in your tray and add a little extra olive oil and a grind of salt and pepper. Bake on the top shelf of the oven for 20 minutes or until crisp.